Guaranteed not to leak! 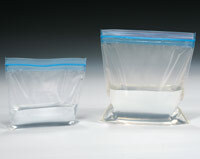 Patented side seals and double-track zipper ensure safe transport and storage of infectious specimens. Available in polyethylene for short-term storage or Saranex® film for long-term storage that reduces formaldehyde odor. Some odors may penetrate. Meets FDA and USDA specifications for food contact.